When I think of brownies, I think of the ooey-goey texture with a decadent, in fact all-consuming chocolate flavour and a few textural additions. This is on point with the Christmas feeling (and flavour) and will be a welcome switch over from Christmas pudding this year. Here’s the recipe, do try out and let me know how it goes. Melt the butter and chocolate in a medium saucepan on low heat, stirring constantly. Remove from the heat, pour into a large mixing bowl, and allow to cool. Line the bottom and sides of a 9×9 inch square baking pan with aluminum foil, this will help with removing the cake later. So ensure there’s an overhand on all sides. Whisk together the granulated and brown sugars into the cooled chocolate mixture. Add the eggs, one at a time, whisking until smooth. Add in the vanilla. Gently fold in the flour, cocoa powder, espresso, cinnamon and salt. Once combined, fold in the chocolate chips, cranberries/sultanas and orange zest. Pour batter into the prepared baking pan and bake for 35-40 minutes or until the brownies almost pull away from the foil. When you insert a spaghetti or toothpick the batter should still be moist and you don’t need to worry about that because these turn out to be perfectly done for the texture you’re after. Mix all the ingredients until it forms a drizzly mixture. The consistency can be altered with more or less milk. 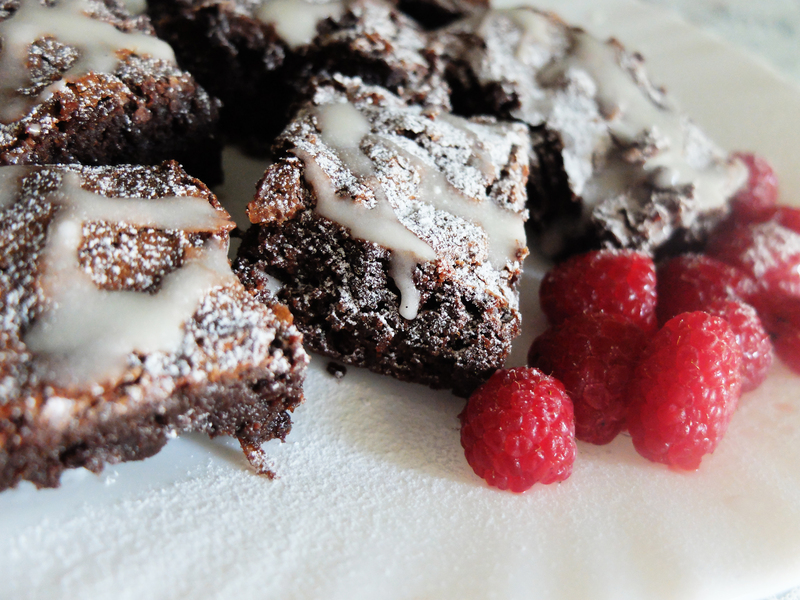 Drizzle this on top of cut brownies and top them with powdered sugar and fresh raspberries! I can’t recommend this recipe enough and if you’re in a pickle about Christmas pudding this year, give these a try, may be you’ll find yourself a winner!